The only non-Tuscan of the traditional trio of High Renaissance greats, Raphael (Raffaello Sanzio, 1483–1520), was born in Urbino in the Marches. A sublime draughtsman, along with Leonardo or Michelangelo, his reputation in recent decades hasn't held up as well as those of the others. 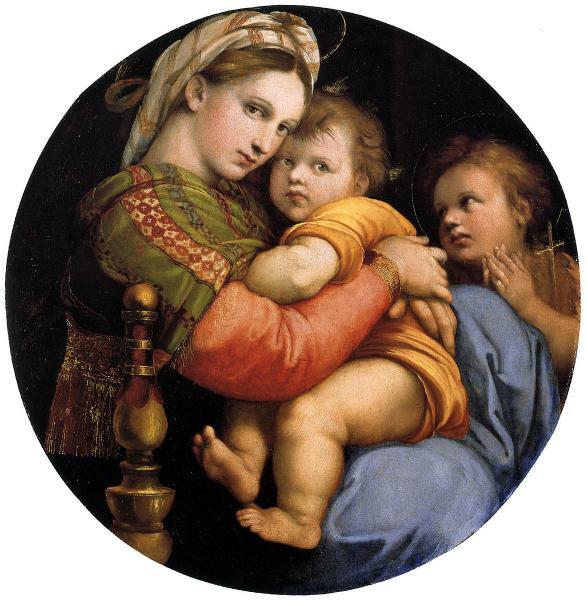 Raphael's genius was to produce ideal forms, balance, clarity and grace. We prefer messier, more realistic humanity. A student first of his father, a rather average painter in the employ of the Duke of Urbino, and later of Perugino, Raphael spent time in Città di Castello and Perugia, before arriving in Florence in 1504, where he spent four years before Pope julius II called him to Rome, where he spent the remainder of his 37 but very prolific years. Yet many of Raphael's best works remain in Florence. The Medici collected them like mad: in the Palazzo Pitti you'll find the portraits of Agnolo Doni and Maddalena Doni and Tommaso Inghirami, the Madonna of the Grand Duke in her red dress, the tender Madonna della Seggiola, the Woman with a Veil, Vision of Ezekiel and Portrait of Cardinal Bibbiena (whose niece Raphael was betrothed to, but never married, preferring his beautiful baker's daughter in Rome). Others are in the Uffizi: Self Portrait, Madonna of the Goldfinch, Portrait of Julius II and Portrait of Pope Leo X with Cardinals Giulio de' Medici and Luigi de' Rossi.